Large parts of Edinburgh will be classed as having too many businesses selling alcohol under radical plans to curb the number of new drinking premises in areas of the city. Previously, only Cowgate and the Grassmarket were designated as offering over-provision of licensed premises – but under the new licensing statement, the Old Town, Princes Street, Leith Street, Tollcross, Dean Village, the West End, Haymarket, Southside, Canongate and Dumbiedykes will all also be classed as already providing enough opportunities to purchase alcohol. There will be a preumption against new bar openings in the city centre. The new policy throws into doubt the viability of major new licensed premises in swathes of the city – with the Virgin Hotel, Gleneagles Hotel as well as the multi-million pound new Edinburgh Gin in the Old Town and Johnnie Walker Experience visitor centre in the former Fraser’s Store announced just last week. Convener of the board, Cllr Norman Work said: “Our assessment of overprovision takes into account a range of evidence and feedback provided during our in-depth consultation with a variety of organisations, health professionals, trade representatives and other interested parties, and I welcome the outcome. 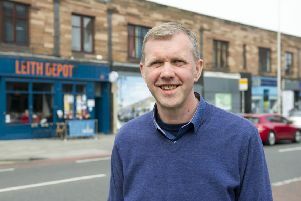 At the licensing board meeting, Green Cllr Steve Burgess tabled a motion calling for The Shore, Constitution Street, Great Junction Street, South Leith and Pilrig to be included – areas where at least 34 premises and 14 off-licences are within a 10 minute walk or 800 metres of the local centre. Cllr Work, who arrived 15 minutes late to the meeting, became frustrated over attempts to change the draft proposals. He then later told Cllr Burgess when tabling a motion into restricting the hours premises can sell alcohol, that he couldn’t speak about the issue.